Go to original pattern for design DROPS 186-36. Crocheted square jacket with lace pattern. Sizes S - XXXL. The piece is worked in DROPS Big Delight. DROPS CROCHET HOOK SIZE 5 MM / H/8 – or the size needed to get (1 double crochet + 3 chain stitches) 4 times in width and 6 rounds on 10 cm / 4'' in width and 10 cm / 4'' in height. 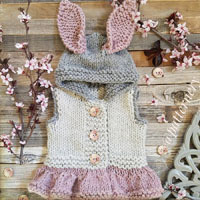 You can get the yarn to make this pattern from	39.00$. Read more. 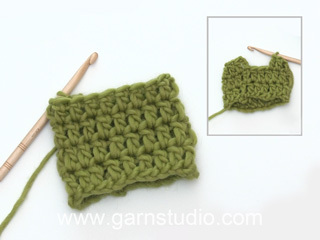 The first double crochet at the beginning of the row is replaced by 3 chain stitches. Decrease 1 repeat (= 1 double crochet + 3 chain stitches) by working 2 double crochets into 1 double crochet as follows: Work 1 double crochet around the first chain-space, but wait with the last yarn over and pull through, work 1 double crochet around the next chain-space and pull the last yarn over through all 3 loops on the hook, 3 chain stitches. The piece is worked in the round from mid back and outwards in a square. Work in the round in a spiral, from and including round 2 and to finished length of the square. Then work back and forth on the front pieces. 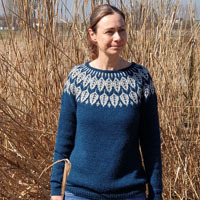 The sleeves are worked in the round from the body. The piece is worked in the round into a square, starting from the middle of the square. Start with hook size 5 mm / H/8 and Big Delight and work pattern according to diagram A.1 - NOTE: As shown in the diagram, only round 1 is worked together at the end of the round, the other rounds are worked in a spiral. REMEMBER THE CROCHET GAUGE! 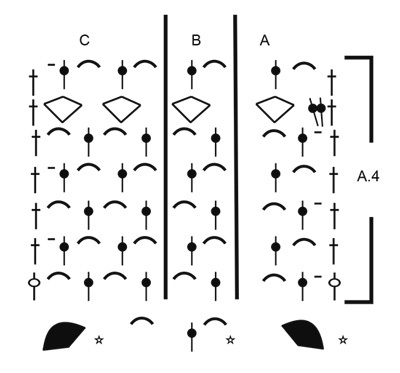 When the diagram is finished, there are 9 chain-spaces along each of the first 3 sides and 11 chain-spaces along the fourth side (= bottom edge of jacket). Continue by repeating the 3 last rounds, i.e. increase 1 double crochet + 1 chain-space from corner to corner (= a total of 4 increases on the round) for each round of chain-spaces. 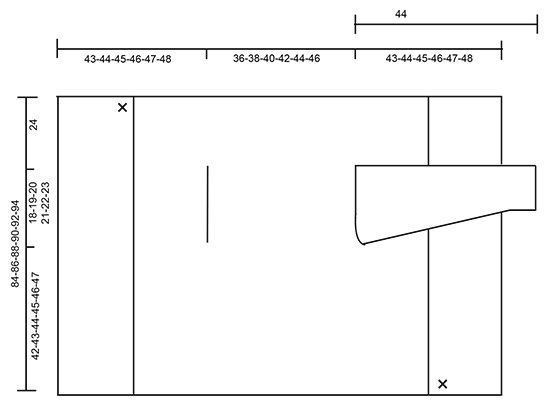 Continue with the pattern like this until the piece measures 36-38-40-42-44-46 x 36-38-40-42-44-46 cm / 14¼''-15''-15¾''-16½''-17¼''-18'' - adjust so that you finish after the last of the 3 rounds. Now work the armholes as follows: Work as before as far as the middle of the first side, then work chain stitches to the first corner as follows: work 1 chain stitch for each chain stitch/ double crochet you skip, work 1 treble crochet + 3 chain stitches + 1 treble crochet around the corner, continue pattern as before along the next side and work 1 treble crochet + 3 chain stitches + 1 treble crochet around the corner, work chain stitches to the middle of the next side as follows: work 1 chain stitch for each chain stitch/double crochet you skip, continue pattern on the last half of this side and to end of round. Then work 2 rounds the same as the first of these 3 rounds in this repeat (i.e. rounds of chain-spaces) - work also around the chain stitches for the armhole. Then work 1 round the same as the second of these 3 rounds in this repeat (i.e. a round of double crochet groups). Then work in the round (with increases as before) according to diagram A.2 a total of 1 time in height, then work in the round (with increases as before) according to diagram A.3. Repeat A.3 in height to finished length. Continue in this way until the square measures approx. 84-86-88-90-92-94 cm / x 84-86-88-90-92-94 cm / 33"-34"-34½"-35½"-36 1/4"-37'' x 33"-34"-34½"-35½"-36 1/4"-37'' - adjust so that you finish after a round of chain-spaces (i.e. approx. 24 cm / 9½'' in all sizes from the armhole). Cut and fasten the strand. 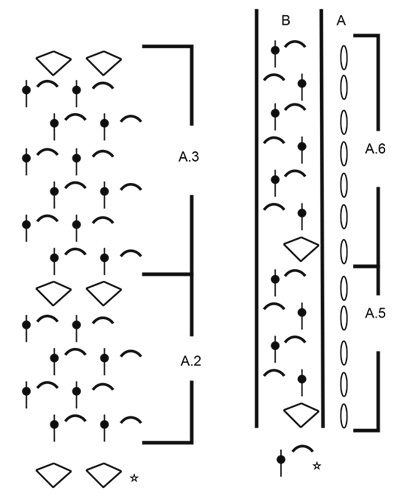 The front pieces are worked separately, back and forth without increases. Insert 1 marker on the last round worked - THE PIECE IS NOW MEASURED FROM HERE! 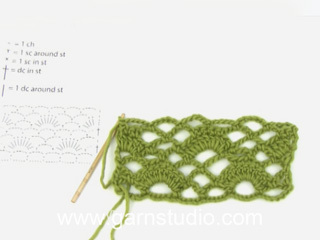 Start at the cross in the one corner - see sketch, and work as follows: Read CROCHET INFO. Work A.4a around the corner, repeat A.4b until there is 1 chain-space left before the next corner, work A.4c. Repeat A.4 in height until the piece measures approx. 19-20-21-22-23-24 cm / 7½''-8''-8¼''-8¾''-9''-9½'' - adjust so that you finish after a row of chain-spaces. Cut and fasten the strand. Work the other front piece in the same way. Crochet an edge around the whole jacket as follows: Work 1 double crochet + 4 chain stitches + 1 double crochet around the corner, * 4 chain stitches, 1 single crochet around the chain-space *, work from *-* along the whole piece - but in the corners work 1 double crochet + 4 chain stitches + 1 double crochet. Cut and fasten the strand. The sleeve is worked in the round, top down from the armhole, starting mid under sleeve, from the right side. The first round is worked evenly around the armhole as follows: Work A.5b a total of 17-18-19-20-21-22 times - A.5a shows how the rounds start and finish. 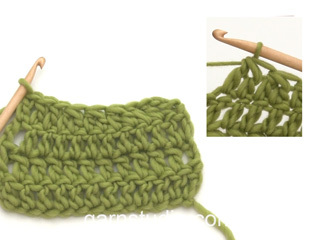 A.5 is worked a total of 2 times in height, then work A.6 to finished length - AT THE SAME TIME as you decrease 1 repeat at the start of the 5th round by working 2 double crochets together mid under sleeve – read DECREASE TIP. Decrease like this approx. 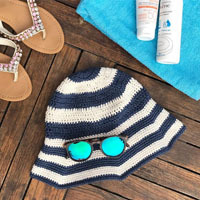 every 5th-5th-4th-3rd-3rd-3rd round (adjust so that you do not decrease on a round of double crochet groups) a total of 4-4-5-6-6-7 times = 13-14-14-14-15-15 double crochets/chain-spaces on the round. Continue the rounds without decreasing until the sleeve measures 44 cm / 17 1/4'' in all sizes - adjust so that you finish after a round of chain-spaces. Then work a finishing round as follows: * 1 single crochet around the first/next chain-space, 4 chain stitches *, work from *-* to end of round and finish with 1 slip stitch in the first single crochet. Cut and fasten the strand. Work the other sleeve in the same way. = shows previous round, Start on next round! 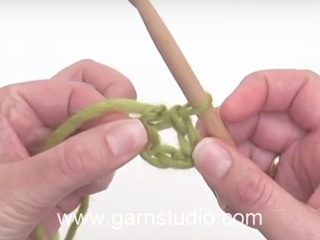 = double crochet around chain-space, but when A.4 is repeated in height work the double crochet in the stitch. Ik heb toch even een vraag over het ruggedeelte. Als ik de vest aantrek dan blijft het onderste deel van de rug golven, is niet mooi vierkantig, onderste deel van vierkant is breder en dus golvend !!!????? Hallo Ann, Dit is helaas een beetje inherent aan het patroon. De bovenkant blijft goed zitten, omdat die om je schouders zit en aan de onderkant gaat het altijd wat golven door dat de voorpanden los hangen en in verhouding langer zijn. Liebe Yvonne, beim A.3 weiterhäkeln werden Sie wie zuvor zunehmen, Sie sollen immer die gleichen LmBogen/Stb in jeder der 3 Seiten und beim letzten Seiten 2 mehr haben. Viel Spaß beim häkeln! What does this mean in the pattern? I have completed the first diagram part and I am having a hard time understanding where I need to increase. 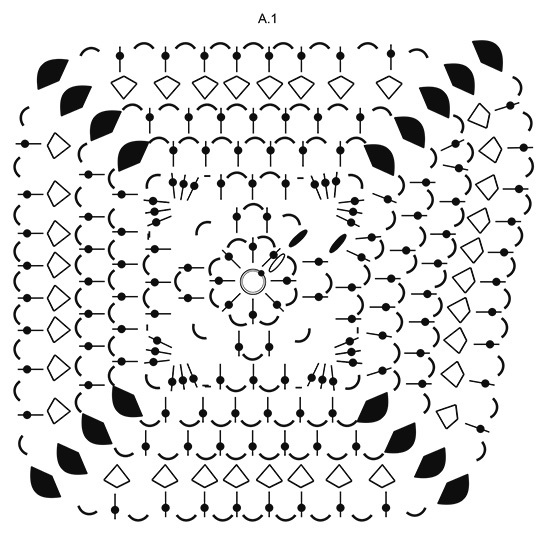 From pattern: Continue by repeating the 3 last rounds, i.e. increase 1 double crochet + 1 chain-space from corner to corner (= a total of 4 increases on the round) for each round of chain-spaces. Dear Sara, the last three rows of the diagram shows you how to increase in the corners to teh piece will be a growing square. (in each roner you increase 1 dc + 1 ch-sp - in the whole round all together four times). Continue to repeat these last rows until you reach the necessary size.